Inclement weather cost Girls Prep hockey fans two games this past weekend involving top five clubs, the results of which would have gone a long way into forming this week’s HNIB News Girls D1 Prep Top 10. It doesn’t mean there wasn’t any movement, however. Tabor (12-0-1), which had its game with #5 Loomis Chaffee wiped out, had a pair of wins over Thayer (7-1) and Milton (4-1) and remains at #1. The Seawolves will take on Westminster Saturday. Williston (13-1-1) climbs up to #2, its only result a 3-0 shutout over Dexter Southfield. The Wildcats also face Westminster (on Wednesday) and then Hotchkiss (Saturday). #3 Nobles (12-0-4) was tied by Rivers (2-2) and then blanked Exeter (4-0). 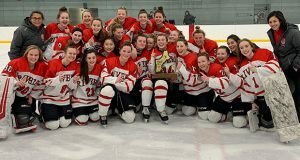 The ‘Dawgs will see Lawrence Academy (Wednesday), Cushing (Friday) and then have a showdown Saturday with #6 St. Paul’s. #4 Loomis Chaffee (8-2-4) is playing well and was hoping for a crack at Tabor. The Pelicans are coming off a pair of 4-1 wins over Taft and Westminster. They get BB&N (Wednesday) and then Greenwich Academy (Friday). 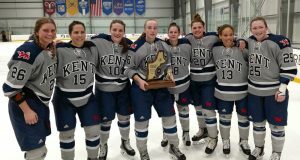 #5 Kent (9-3-0) saw its game with Williston postponed, so its only result was a 6-0 win over Pomfret. Choate (Wednesday) and Taft (Saturday) provide this week’s opposition. #6 St. Paul’s (12-2-1) shut out KUA Friday (2-0) and tangles with Northfield Wednesday before the big one with Nobles Saturday. 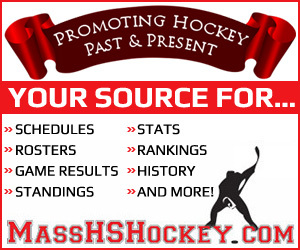 A week featuring Cushing (Wednesday), BB&N (Friday) and Deerfield (Saturday) awaits #7 Phillips Andover (6-1-3). The Big Blue had a 2-0 win over St. Mark’s. #8 New Hampton (10-3-1) had a big 5-3 win over Deerfield and then another 5-3 decision of Pomfret as it looks to make a run. 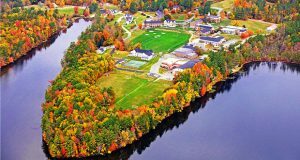 The Huskies get set to face Winchendon (Wednesday), Vermont Academy (Friday) and St. Mark’s (Saturday). This week’s rankings also feature the debut of two new teams with Hotchkiss (7-1-2) at #9 and Deerfield (9-5-2) at #10.